Acres and acres of column space have been devoted to reports about how the iPhone X sales are falling below market expectations, but according to Canalys, Apple still managed to ship 29 million iPhone X units worldwide in Q4, 2017, making it the best-selling smartphone during the period. The iPhone X reportedly outsold its stablemates, the iPhone 8 and iPhone 8 Plus, both of which were unveiled alongside the device that has since attained cult status in spite of being the most expensive handset ever launched by the Cupertino giant. The device was unveiled back in September and started shipping in in November. It starts at $999 for the base 64GB version, and goes up to a whopping $1,149 for the 256GB model. In India, the phone is currently available for Rs 84,999 under the sales on Amazon and Flipkart. 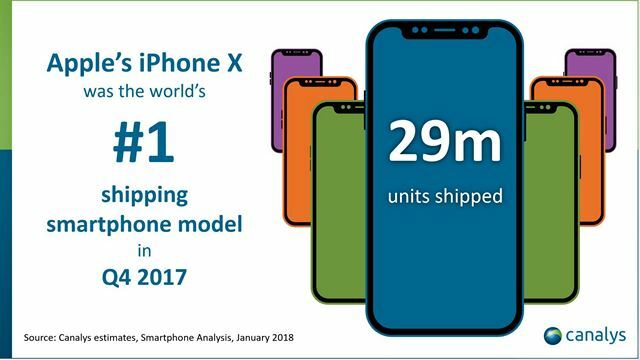 According to Canalys analyst Ben Stanton, though, demand is still less than expected in many regions around the world, even though people are “increasingly realizing the residual value of their old smartphones, (and) opting for trade-in programs to offset the high price of the iPhone X”. However, the high price-tag, supply-side issues and “Apple’s split launch strategy” apparently held it back from becoming an even bigger hit. The Canalys report also says that older iPhone models like the iPhone SE, 6s, 7 and 8 models also did well in Q4, with many users wanting to be a part of the iOS ecosystem without having to splurge on a cutting-edge device. According to Canalys Analyst Tuan Anh Nguyen, Apple’s strategy of offering older devices at reduced price-points “has hedged (the company’s) risk as it upgrades the iPhone, in both design and user experience”. While bleeding-edge technology in devices like the iPhone X helped Apple maintain its leadership position at the premium end of the market, more pocket friendly devices helped the company compete with Samsung, Huawei and Google, because “having a larger portfolio allows Apple to meet its overall shipment targets”.